I think the most important aspect of dealing with kids like this is to have an honest, coaching conversation with them. One that illustrates the complexities involved in making a living gambling. You don�t want to come from, �It�s not possible,� because obviously it is. 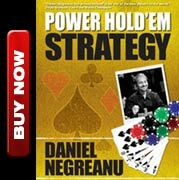 There are thousands of professional poker players in the world, but I can�t think of a handful of pros that are successful today that are not treating it like a serious job and working hard both playing and studying the game. So my intention in this coaching conversation is to really illustrate what it takes to make a living doing this. To have them fully understand what it really looks like, but doing so in such a way where it�s they themselves that are realizing it, rather than me preaching to them that they shouldn�t bother trying. I start by explaining to them that a professional poker player is a small business owner, in the business of entertaining their customers (players who aren�t as skilled as they are). Most every successful business has a mission statement. Since this is a one man small business let�s call it a vision statement. That�s just one example, you need to write one that speaks to you personally because you will be coming back to this statement often. It is the statement that will guide you during your career. The next step is to get a little more specific and quantify what abundance looks like for you. A concrete yearly income you are hoping to achieve. For this example, let�s use $100,000 as the goal. 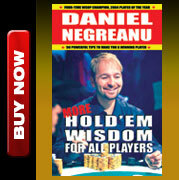 For example, let�s say your bankroll and skill level have you playing $2-$5 no limit hold�em at Bellagio. It�s important to know how much that game is worth to you. The best place to start would be to ask around and see what the best player in that game can expect to make, then deduct about 30% from that total. Yes, you may become the best player in that game, but until you have proven you can be, lets assume you are still in the learning phase and shouldn�t expect to jump out of the gate and be the best player at the table. Based on what I�ve heard, the best players in that game may make as much as $30 an hour. Deduct 30% from that, if all goes well you can target $21 an hour. To make the math easier, let�s just make it $20 flat per hour. Since our goal is to make $100,000 a year, now we can have a rough idea of how many hours we actually need to spend at the table playing poker. That comes to 5000 hours a year playing. If we break down that further, that comes to 417 hours a month, which breaks down to over 100 hours a week! This is before we even add all of the study hours required to be in line with our vision statement. For ever 10 hours of play, you should add at least two hours of study time. Add on another 1000 hours a year of study, which boils down to 14 hours a week. So now we have you playing 105 hours a week, and studying around 14 hours a week for a total close to 120 hours in a week. Do you know how many hours are in a week? 168. If you plan on sleeping 8 hours a night, that's another 56 hours a week. With work/study at 120 and sleep at 56, that totals 176 hours a week. Uh oh, Houston we have a problem! While your vision statement was quite clear as was your goal, your plan just isn�t feasible. It�s just not humanly possible unless you plan on skipping out on sleep entirely and having absolutely no social life whatsoever! No matter how good you play, your plan is destined to fail and it will. So the most obvious thing to adjust is your expectations on your yearly income. Maybe lowering it from $100,000 down to $50,000 a year. To save time, let�s assume you can make a plan work where you make $50,000 a year working very hard. Will this allow you to create abundance in your life? Maybe, maybe not. That depends on your monthly nut, meaning how much your expenses cost you monthly. We are also going to assume you are a law abiding citizen who pays their income tax, so right off the bat let�s whack of 30% of that $50,000 a year. That leaves you with $35,000 to spend over a 12 month period, or about $2900 a month. You want a car, you will have rent to pay, and I assume you also may want to eat food at some point. Maybe even have a telephone and wifi in your apartment. So let�s say you find an apartment for $1200 a month, spend another $300 on your car and gas, and then $1000 a month for food. That�s $2500 total, leaving you $400 a month to cover EVERYTHING else! Not to mention the fact that you need to maintain a bankroll big enough to deal with the inevitable swings. Heaven forbid you ever have to fix your car or get a speeding ticket! If you aren�t playing with a bankroll big enough to play the games you want and live the lifestyle that you want, then what is your plan if you run out of funds? How will you stay in action? Borrowing from friends is one option, but how will you ever build a bankroll big enough to pay them back? At best, you have an extra $400 a month. If you borrowed $5000 it would take two years of everything going perfectly for you to pay them back. How many people do you know that will loan you $5000 on the hope of being paid back in two years if all goes well? So you will get staked you say? Ok, so now someone is putting up the money for you to play in the $2-$5 game and you get to keep 50% of your winnings. Now you will also have to slash your monthly earnings to $1450 a month while your living expenses are at $2500. You are still underwater. Well what if I get staked to play higher limits? OK, so you are going to find a backer to put you in $5-$10 games where you have no experience, there are tougher players, and your win rate isn�t guaranteed to be any higher than the $2-$5? Good luck with that. This is all painting a dark picture by design. It is the reality that most of you who are hoping to become professional poker players face. One that can�t be ignored. Is it possible that you have the work ethic, the modest monthly nut, the skill set, the emotional stability, the drive, the will, the bankroll, etc. Sure, but don�t be fooled. There are maybe 2%-5% of people that can make this lifestyle work. Less than 5% of ball players in the minor leagues will ever make the big leagues. Even less high school football players putting on weight in the hopes of an NFL career will make it. There are many careers where the odds are heavily stacked against you. There are heroes, those special people who have �it� and find a way to make it, but most will fail. This holds true in poker as well. My intention wasn�t to discourage you from chasing your dreams, whatever they may be. My intention was to illustrate to you that it will require HARD WORK. It will not be as easy as it looks on TV. Are you willing to put in all that hard work, all the while knowing that even if you do, it still may not be enough?